We aim to publish photos of the family and a full transcript in due course! Administrator Alex Mitham took a walk to Anchorstock on 7th January 2016. He took the long route, first climbing to the Base at Burntwood, along First Gulch and then straight clambering down to the far west of Tristan known as Anchorstock. 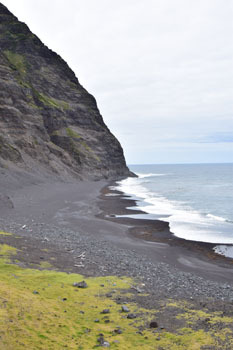 The old path from the Bluff is regarded now as too dangerous due to erosion of the cinders. 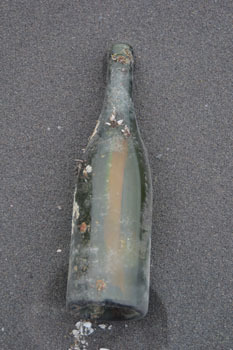 On the beach Alex discovered an old bottle in which he found a message, both of which were brought back to the Residency. He took two photos of the bottle below. The message needed ironing out and parts cannot be clearly read. Alex's wife Hasene has worked with the Editor to try to work out and translate the message - and we think we've found out who wrote it and the gist of his remarkable message. We publish the text below in an edited English format. Now we want help to find the writer and hope he will contact us to complete the lovely story - can you help? 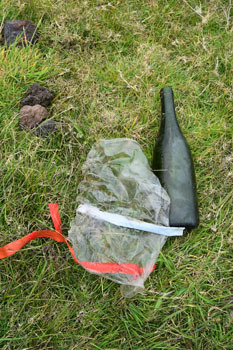 from which he dropped the bottle. If true the message has been found over fourteen years later. This day is especially important for emigrants. We (emigrants) know more than anyone else about home sickness. So I wanted to greet all emigrants, including those from Galicia. In memory of them is this greeting, hoping the ocean will carry the message. I call on the apostle James and for Broegan (a medieval Galician king) to ensure the message arrives. I need only say that I am a fisherman in the Falkland Islands. who now lives in Pontevedra, through local media contacts and we are now in touch with his daughter, Maica Juncal. I and my family are thrilled with the news and overwhelmed by social relevance it had on our city. For us it is a pride and we are very grateful to Alex Mitham, to find the bottle, the interest in translating the message and from the other side of the world trying to find the author of the message. My father is a seaman for over forty years and his work has led him to spend long periods away from home. I still remember when he came home and told us that threw bottles with messages into the sea, and the wish that someday some of them appear, which would be like a treasure in time. The message was written in Galician, which is the language of Galicia. The 25th of July is the day Santigo apostle, the patron of Galicia and Spain. for us it is a very important day, and I guess that's why he wrote the message, longing for home and family, for being so far from their own, a memorial to all the men who never returned home, friends, colleagues or acquaintances who the sea took, or like him, carrying a hard life away from their loved ones, sacrificing his own life so that we never miss anything. I imagine that that day had a lot of "homesickness". 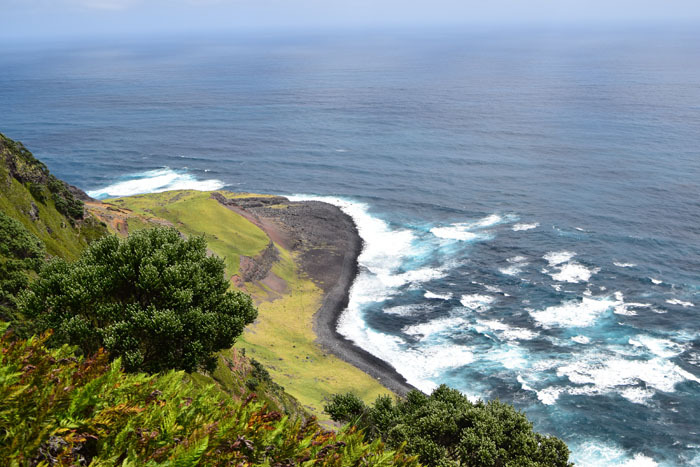 Homesickness is a Galician word meaning longing, miss, widely used by all sailors or anyone who is away from their homeland. We are delighted that this message has started a new link between Tristan and a fishing community in Spain. Maica now has the scan of the original message and will work with her father to give us a full and accurate transcript which we will translate and publish. 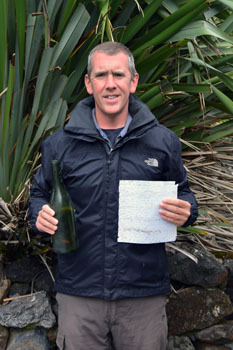 We plan to publish another photo of Alex Mitham with the bottle (which is still at Anchorstock and very difficult to get to!) and, with their permission, photos of Candido and his family. We will invite Candido to tell us more about his 1999 work when he was fishing around the Falkland Islands. So watch this page for the next 'Message in a Bottle' update.